Low Back Strengthening Exercises are important for overall core strength. This page has pictures of some lower back exercises on the Bosu Ball. If you don't have access to a Bosu Ball, no worries try these back exercises on the floor. 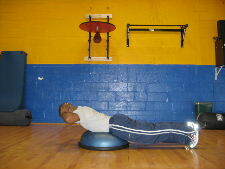 Starting Position: Begin by lying face down on the Bosu Ball and place your hands behind your head. Form: Exhale and lift your chest off the ball. Hold briefly at the top of the motion and then slowly return to the starting position. Personal Trainer Tips: Keep your knees straight throughout this exercise. Try only to move your trunk, not your legs. Your position on the ball will affect the range of motion and muscle work. The more your lie towards the side of the ball by your head, the more range of motion and more muscle work you will feel. This exercise is similar to the above exercise. The difference is the rotation at the end of the motion. This is a great core exercise for golfers. 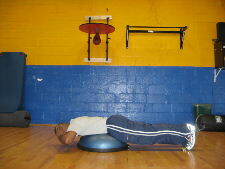 Starting Position: Begin by lying face down on the Bosu Ball with your hands behind your head. Form: Exhale and lift your chest off the ball. As your body gets just above parallel to the floor rotate your body to one side as far as you feel comfortable. Slowly return to the starting position, and then lift and rotate to the opposite direction. 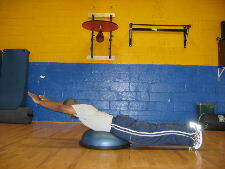 Personal Trainer Tips: This is a challenging exercise because it requires good flexibility and good strength. It is important to master the regular back extension exercise above before attempting this exercise. Perform 5-15 repetitions on each side and then rest. The Super Man back extension is more difficult than the regular back extension because the arms are extended over your head. Form: Keeping your arms straight over your head, exhale and lift your chest off the ball. Hold briefly at the top and then slowly return to the starting position. Personal Trainer Tips: Move in a slow and controlled manner. Perform 8-15 repetitions and then rest. 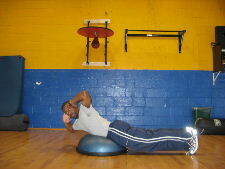 Low back strengthening exercises can be done on the floor, a full exercise ball, or even the half ball.